You've done something amazing here! You've transported me from my dull, gray office of 2012 back to being a kid on a sugar high, frolicking around an amazing place for the first time. This is nothing short of magical! Well done! Wow! Thanks for the hard work... it's loaded on my iTunes already. Thank you!! Let me be the first. Congratulations on putting together such an ambitious project. It's going to be well-received. Wow, this is amazing. My collection of WDW BGM didn't stretch far past the late 80's, so this opens up a whole new world of park music I haven't really been exposed to. And now, a question. There was an odd bit of BGM that, up until the Nook opened, played in the backstage patio outside the Veranda. Sounded vaguely Middle Eastern, so I assumed it was part of the Agrabah Bazaar loop. But what was it? I'm assuming someone forgot to turn it off. Icclench: if my memory doesn't deceive me, I believe that was indeed the Agrabah Bazaar loop. I have no idea why it was playing there, as that space has been used for Lilo & Stitch and Ariel previously. This reminded me of why I fell in love with Disney World when I was a kid and why I can not stand it today! This is absolutely terrific! I'm a long-time reader but I think this is the first time I've commented. I am a huge fan of your blog and analysis, and this music collection (and the GORGEOUS PDF guide) is awesome. This is just fantastic! Really brings back some memories. 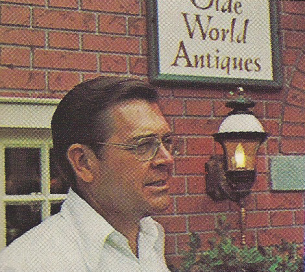 And it also whets my appetite to try to find the Magic of Walt Disney World recording session that was used as a source, because I have always enjoyed Buddy Baker's music in that film. Can anyone help with that? This is pure magic. It takes me back to my visits to WDW in 70s. Some of these I haven't heard since that time long ago. Um....not sure if it's possible since we don't actually know each other, but we're officially BFF now that this exists. So seriously, excellent work. If we could somehow add smellitzers to the interwebs, we could all relive 1977. 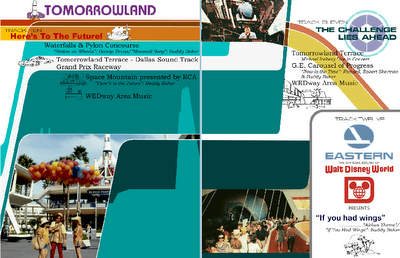 I've been semi-obsessively listening to the large archive celebrating Disneyland, in particular the Tommorowland sections featuring the attractions and music from the earliest days through the introduction of Space Mountain. Perhaps most of all, I've been listening to Adventure Thru Inner Space, the yin to If You Had Wings yang in many ways. Have I mentioned how deep an impression IYHW made on me? I do have a treasured recording from a trip made in 1983 (which I think came out very well) that I have listened to hundreds of times. But I am very much looking forward to listening to your musical souvenir. One of the failings in tribute compilations largely derived from source material is the difficulty to convey how the attraction sounded as a real experience. The hums, clacks, ambient noises, fades, echoes - so many things that are integral to putting it all in context. Thanks very much for your hard work, this is unexpected but incredibly welcome. What a gift, thank you! I just found this and can't work through the tears in my eyes. I've been going to the park since a week after in opened in 1971. You said it all in your intro: these are the wonderful details of my memory. Music is such an important part of my life, but so are the background sounds and smells of the Magic Kingdom. I can't begin to thank you enough for this amazing tribute to the Magic Kingdom that will always hold a special place in my heart. My dad use to take the family tape recorder all over the Magic Kingdom in the 70s and tape all the background music, as well as the rides. One of our favorite tapes was from Main Street USA when it first opened. This soundtrack played for quite a long time before it was changed. One day my dad came home with a gleam in his eye and a package in his hand. He took out an LP and put it on the record player. The entire family burst into smiles. It was the record Disney used for Main Street. Dad said it was the order of the songs that made a light bulb go off and he ran home with his purchase to make sure his hunch was right. Goodness how I miss If You Had Wings and the RCA song in Space Mountain. It makes my heart hurt sometimes when I hear the music. Simply put, this is amazing. Thank you for all your hard work, Foxx. I love this. I have been systematically going back and reading ALL of your posts from the very beginning (still have a way to go). I have a whole new appreciation for Walt Disney World, particularly the early years. So, thanks as well for your amazing blog. It breaks my heart to tell you I don't have them. I carried them around from apartment to apartment over the years (I live in Manhattan). The last time my husband and I moved the box containing all the cassette tapes (probably 40) went missing, along with all my early photos of the Magic Kingdom. I'm so sorry. Some of them were worn out from my listening to them so much. A good percentage of them were of the Dapper Dans as we are HUGE fans of them. I'm still in touch with many of them. Also, are you aware that Bev Bergeron, who played and learned the roll of Pecos Bill from Wally Boggs, has a CD of the original Diamond Horseshoe Revue? It is put together from various fan's old video tapes (my dad use to rent a stroller and push around a car battery with a blanket over it, lol, to keep his video camera running back in the day!). 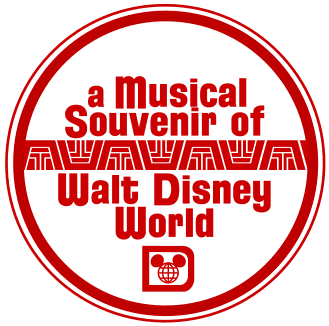 Much of it is from the last performance (Diamond Jim was performed at that time by Jerry Siggins who was one of the original WDW Dapper Dans). Bev sells the video for $15 on his web site. Darn I wish I had those tapes--I would have been more than happy to lend them to you. I never dreamed anyone cared about this stuff like I do. If I can answer any other questions please don't hesitate to ask. Aw, well, that's really a shame. Early audio recordings of the theme parks are especially scarce. I spent a few months attempting to identify the original Tomorrowland music with no luck - even the Archives and Walt Disney Imagineering didn't know that info. Because Wagner pretty much worked alone, the choices he made were not -always- properly documented. Thanks for the tip on that LP, I've got a copy headed my way right now. Hopefully I'll be able to get the proper track listing; I believe one of my collaborators has that info. Anyway, thanks very much, and enjoy the audio! Thank you so much for this. 1977 is pretty close to the last time I was in WDW. Not long after that, my family moved to California, and I grew up on Disneyland. WDW has always been my first love, though - we're planning a big week-long return trip for early next year. Wow. A Disney fan "concept album!" This is like, "Sgt. Pepper" or "The Wall" of Disney theme park audio. I LOVE IT! 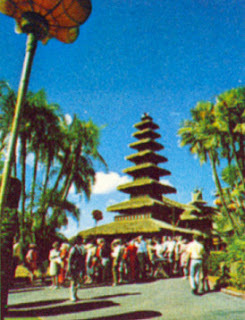 My first visit to Walt Disney World was in 1976. I was eight. We flew Eastern Airlines from Chicago to visit the grandparents. I think I went to WDW every year from 1976 to 1986. So, listening to this today was so much fun. This is MY Walt Disney World. It's a place where Jungle skippers aren't afraid to actually shoot the fake animals, a place where pirates aren't P.C., a place where trips to Volcania, and Mars depart every five to 15 minutes, a place where "park hopping" meant skipping from Haunted Mansion to Mr. Toad, a place where the most popular attraction is an airline commercial because we all burned through our ticket books so fast all that's left is the FREE stuff ... I could go on. Thank you for helping bring back a little of that UNIQUE, PLUSSED Magic Kingdom. The Walt Disney World of this fan's childhood. THEN was the best time. Here's hoping for the future. When I come here I just immerse myself in 1970's Disney. Aaah! And what a project you completed! I can't believe the volume of stuff contained in that download. Thanks for the E-ticket ride in the way-back machine! A masterpiece! Thanks so much! I was a kid in the 70s, and I LOVED the Magic Kingdom from that era! I can still smell certain places of the park in my memory. Holy moly! This is fabulous! My first trip to the world was in 1978! This brings back my childhood! Thanks. Great job with this audio! It really has some great stuff that makes you feel like you are back at the park. I believe I once had a tape from EPCOT with a bunch of the cool music like "Veggie Veggie Fruit Fruit" and "Living with the Land". Any plans to tackle a second gate? Also, I have been trying to find the Sunshine Tree Terrace Loop. Any tips on where to find that? Thank you so much for putting this together! Beautifully done -- Pure magic! Wow, wow and WOW!!! This is amazing. Thank you soooo much. You are a such a treasure to the Disney community. The music and guide are simply awesome. Disney should be hiring you to produce items like this. Thank you, thank you, thank you for all your hard work! This was obviously a labor of love! Finding this and hearing not just IYHW (a favorite) but also the RCA music and entrance tunnel audio from Space Mountain, and particularly my old friend the Tiki Room Barker Bird (although you did leave out my favorite part, darn it!) helped bring many smiles to my face in an otherwise bleak week. (with 2 funerals) I can't thank you enough for sharing your hard work! So awesome, and so many thanks! Wow. So awesome, and so many thanks! Thanks a million for the outstanding work and the living memories! Thank Ya for the Songs. But Can I Have Walt Disney World Vacation Theme (The Magic of Walt Disney World 1972) in It's Full Recorded Version without the Narration. Oh, I'm Wishing from Snow White Ride/Mickey Mouse Revue Version, Please? but what really got me as "huh" was the electronic version of The Moody Blues's Dear Diary. What was up with that one, part of Iceberg's show? Thank you so much for the download...Its excellent. OMG I love this so much! It has everything I remember from my childhood! My favorite is the Tomorrowland section, and the water parade music, too! I never saw that as a kid, but saw it about 10 years ago.